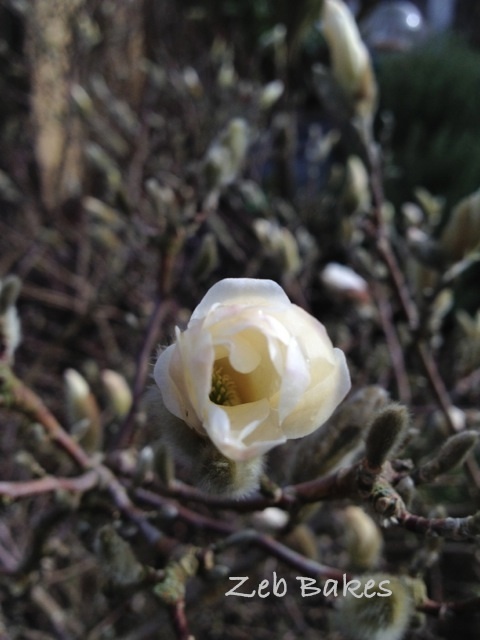 As the temperatures soared yesterday after the longest coldest winter stint we have had here in years, the little magnolia stellata which had formed its flower buds last autumn sometime, started to unfurl its pretty blossoms by the back door. I imagine a wave of blossom spreading across our country this week and there is nothing quite like the boost it gives to our senses. From the lurid yellow of forsythia tumbling over every other front fence, to swathes of daffodils, primroses and celandine, starry wood anenomes, cherries and plums, blackthorn and horse chestnuts with their soft new leaves and pink and white flowers – I am so excited – I don’t want to miss any of it! 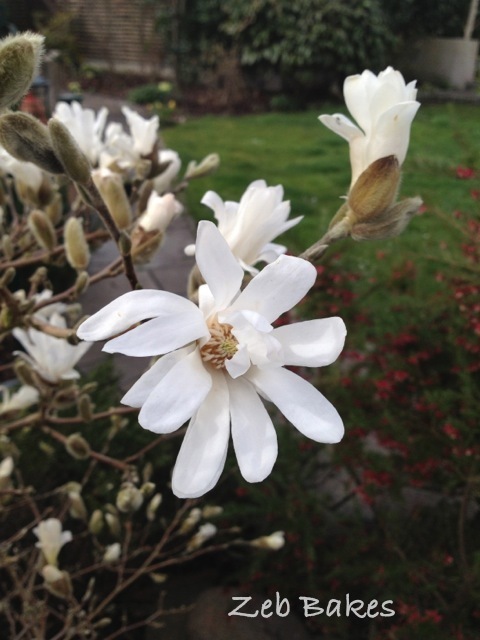 This entry was posted in Garden and tagged April, England, flower buds, magnolia stellata, spring flowers on 15/04/2013 by Joanna. Lately I haven’t felt much like blogging and I haven’t managed to keep up very well with you all working away and writing your lovely stories and sharing your photographs. I am feeling tired and old and quite sad a lot of the time. The drought of winter made way for the rains of April and we are quite sodden in parts of the country now. I am optimistic that May will be gorgeous though ! Mood swings, ageing, ill health are all part of the natural cycle of things for many people, well being tired and old certainly is, so I am not looking for sympathy particularly but just offer you this by way of explanation for my less frequent blogposts. This entry was posted in Bread and tagged aebleskiver, April, baking, Bread, Couronne Bordelaise, rain, sourdough on 02/05/2012 by Joanna. April is the month of showers and young shoots in England and once again the nettles and the wild garlic are overwriting the brown manuscript of faded winter leaf litter in vivid shades of green; baby saplings are shooting from where the squirrels have planted forgotten acorns and hazels – and when the sun shines, muddy puddles glint and poodles dive in for a quick paddle. We walked through the woodland at Ashton Court, passing by the new mountain bike trail along the deer park fence; it has weathered and is not as intrusive looking as it was when it was all raw and new and finally came out on this dusty path down the hill with a view to the sky and Dundry Hill in the distance. The buzzards were busy carrying nesting material around, beautiful big birds outlined against the blue. There was much rustling and squawking and the alarm calls of birds which I couldn’t quite identify; tall trees creaking and rubbing alarmingly against each other in the wind. We walked softly down the side of the hill and along the lower wall. Wood pigeons flew out of hollow trees, wrens whirred and fizzed on their short flights from woodpile to streams, goldfinches bathed in the shallows and for a big city there are always surprises. We heard talking up in the air at one point and realised there were two people chatting in one of the ancient pollarded oaks that are cared for at Ashton Court. I took a picture of the tree they were in two years ago almost to the day. It is a miniature ecosystem in itself, with ferns and fungi and grass growing in its centre. Celandine and wild violets were a couple of the more common wildflowers that we recognised. I nibbled a blooming violet and it was gently sweet. If you can identify nettles, then at this time of year you have a free source of the most wonderful healthy (and, dare I say it, fashionable) green vegetable to add into your supper dishes. I saw a piece by Hugh Fearnley Whittingstall about them the other day here in the Guardian. Brian’s Dad and Gran always ate nettles in the springtime and Brian says his Dad could pick them with his fingers the way he can – must be a special nettle picking gene! Last year around this time I made nettle gnocchi and wrote about them in this post. I haven’t made them since, but I remember they were very good and I really should make them again! Yesterday we picked (that is the ‘royal we’ – Brian picked the most because he has asbestos fingers and I didn’t have any gloves, good excuse!) the top four leaves of young nettles on our walk and I picked a bunch of wild garlic. Both nettles and wild garlic are fairly easy to identify and I have written about the wild garlic on a page here. If you are unsure about any wild plants find someone who is confident about their identification skills and go out with them the first time. Better safe than sorry. You could always borrow Zeb as he is expert at finding wild garlic. We made a risotto with the wild garlic and the nettles that we picked which I will post about next. This entry was posted in Blogging, Bristol, Plant identification, Poodles, Pure Joy, Wild Food and tagged April, Bristol, nettles, wild food, wild garlic on 12/04/2012 by Joanna.